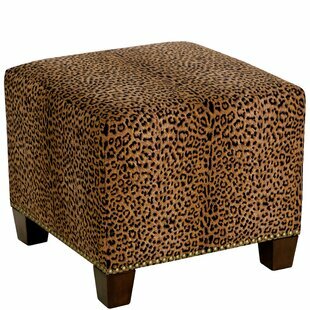 This beautiful indoor ottoman features a thick tufted cushion for maximum comfort and a rustic wooden leg design for a striking stylistic aesthetic. Comes in a beautiful and neutral natural upholstered finish. Cushion is made from polyester fabric and a premium foam insert for maximum seating comfort. Upholstery Material: Polyester Blend Assembly Required: Yes Overall: 16.5 H x 24 W x 24 D Shape: Square Overall Product Weight: 16lb. Kick back in boho beautiful style. 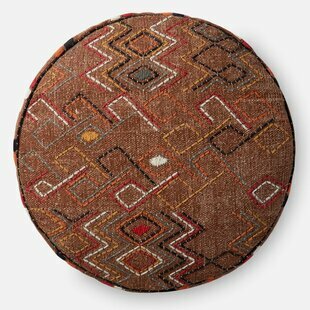 With its patchwork kilim pattern and rich earth tones, this Chama Pouf Ottoman invigorates your space with world beat flair. Upholstery Material: Microfiber/Microsuede Assembly Required: No Overall: 19 H x 20 W x 20 D Shape: Square Overall Product Weight: 6lb. 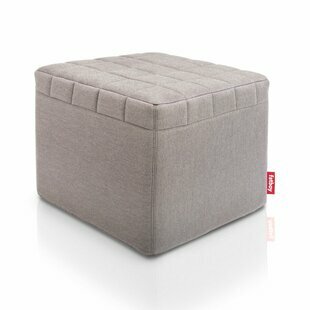 Functionality and style meet with this sleek ottoman. A lovely addition to contemporary aesthetics, it showcases a streamlined square frame crafted from solid wood. 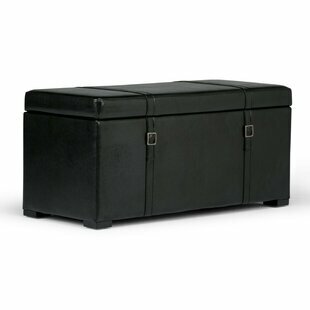 The ottoman is wrapped in faux leather upholstery, which is accented with seam detailing. The top is removeable, so you can tuck away throws, pillows, and more. The top also features a convenient tray on the reverse side, so you can set out drinks and snacks. Upholstery Material: Faux leather Assembly Required: Yes Overall: 19 H x 18 W x 18 D Shape: Square Overall Product Weight: 19.8lb. 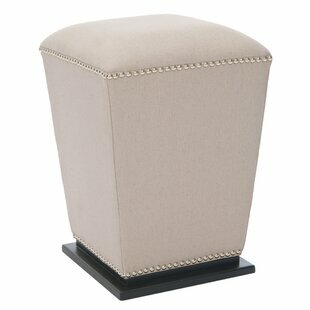 The Sunpan Modern Dario Ottoman is tufted and features detailed stitching on all sides. 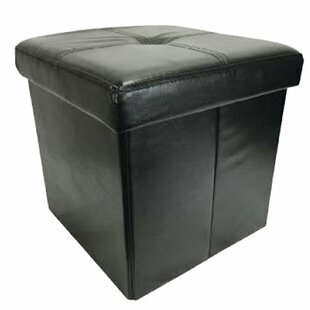 Apart from your home, this ottoman can be used at offices, restaurants, hotels, lounges, and reception areas. 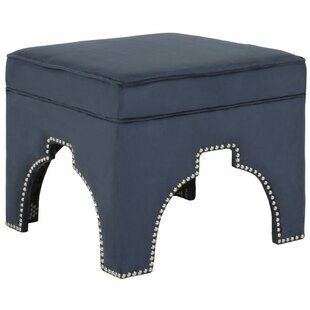 Thanks to the wooden frame, this ottoman is sure to accentuate your home decor for years to come. 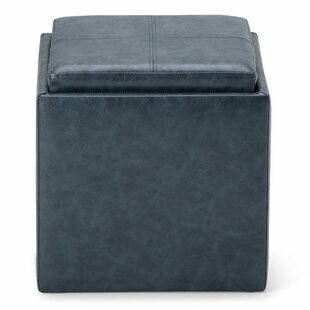 Upholstered in faux leather, this contemporary-style square ottoman is luxurious and refined. It is available in various bright colors, so you can choose the one that meets your styling requirements... Upholstery Material: Faux leather Assembly Required: No Overall: 16.5 H x 16.5 W x 16.5 D Shape: Square Overall Product Weight: 16lb. 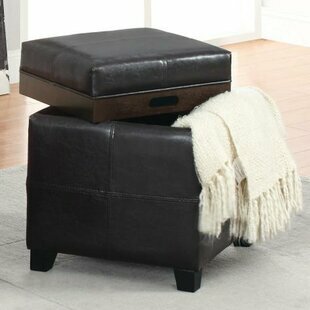 Why choose between a spare seat and an end table when you can have it all with this versatile ottoman? 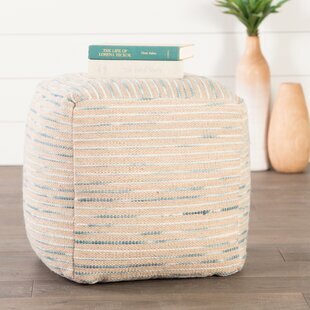 Crafted with a manufactured wood frame, this square piece is upholstered with solid-hued polyester-blend fabric thats easy to clean with mild soap and a damp cloth. Splayed solid wood legs in a natural finish offer a hint of organic appeal, while tufted details dot the design for a touch of texture. After assembly, this ottoman supports up to 250 lbs. Upholstery Material: Polyester Blend Assembly Required: Yes Overall: 17 H x 30.5 W x 30.5 D Shape: Square Overall Product Weight: 19lb. 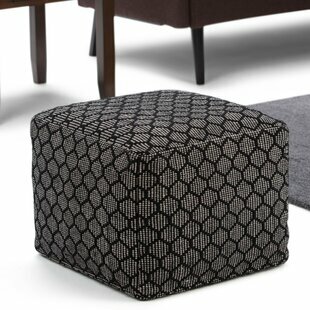 A black and natural pattern makes this Shea Pouf a fun addition to your living space. The upholstered cover is hand-woven for a soft textured look. 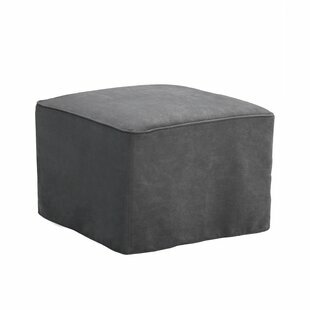 This versatile pouf functions well as an ottoman or casual seat and the handles make it easy to move from room to room. Upholstery Material: 100% Cotton Upholstery Material Details: 100% Cotton Overall: 10 H x 20 W x 20 D Shape: Square Overall Product Weight: 4.85lb. 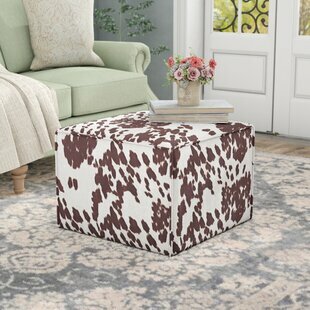 Give your home a bold look with the patterned Simpson Pouf. 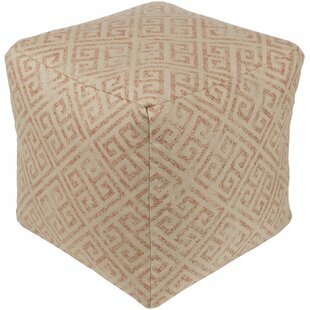 Hand-woven from cotton, the pouf is durable yet comfortable. Its black and natural palette allows it to blend seamlessly into various dcor styles from casual to modern as a seating option or ottoman. Upholstery Material: 100% Cotton Upholstery Material Details: 100% Cotton Overall: 14 H x 18 W x 18 D Shape: Square Overall Product Weight: 4.85lb. 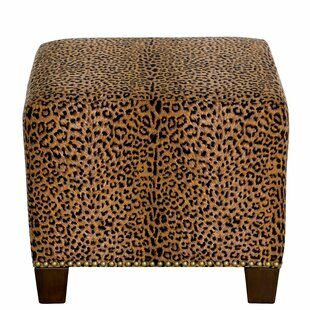 Funky, fun and functional faux fur upholstered ottoman makes a statement and is even softer to the touch. 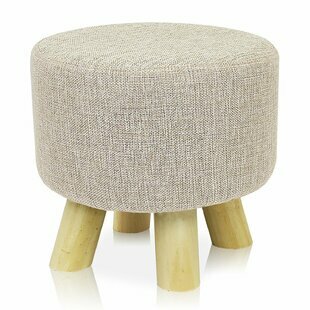 Use in any room as a foot rest, bench or side table. The legs and under the ottoman x-shaped base is crafted in polished steel. Upholstery Material: Faux Fur Assembly Required: Yes Overall: 17.7 H x 17.7 W x 17.7 D Shape: Square Overall Product Weight: 11lb. 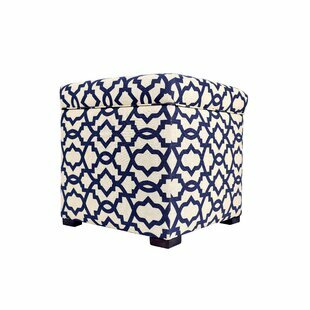 The Colonnade Spindle Ottoman by Studio Designs Home features a plush oversized cushioned top and elegantly carved wood legs. The handsome dark wood finish, cool, neutral fabric hues and piping detail make it a great companion piece for your sitting area. The Colonnade Ottoman can be combined with the Colonnade Spindle Chair in Dark Taupe(Item # 72015) or Latte (Item # 72014) to create a complete lounging ensemble. 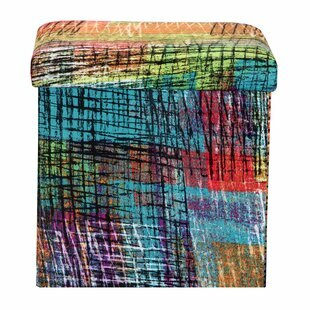 Upholstery Material: Polyester Blend Assembly Required: Yes Overall: 20 H x 20 W x 25 D Shape: Square Overall Product Weight: 13lb. 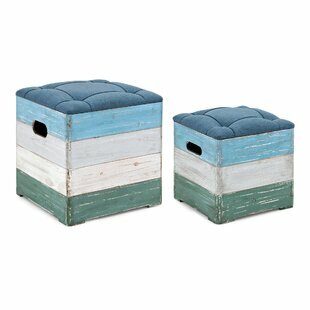 Hidden storage space x2 with this large and small ottoman set! 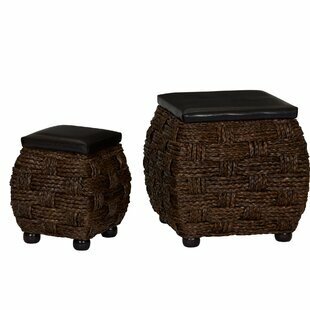 Decorative woven sea-grass rope exterior, faux leather cushioned lids attached and wood feet. Attractive and stylish seating or footrest with storage space inside. Upholstery Material: Faux leather Overall: 18.9 H x 14.75 H x 15.75 W x 9.45 W x 15.75 D x 9.45 D Shape: Square Overall Product Weight: 16.8lb. Upholstery Material: 100% Cotton Upholstery Material Details: 100% Cotton Overall: 16 H x 19 W x 19 D Shape: Square Overall Product Weight: 22lb. Configure arcs, cubes or circles for nearly limitless configurations. Add waves, linear, or pod seating to fit any space. Create instant and adaptable seating for collaboration pods, a quick huddle, and reception room requirements. Padded benches in coordinated PU upholstery. Arcs are configurable to make perfect circles or endless waves. 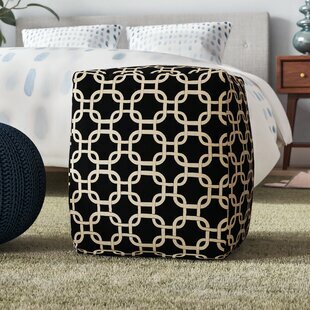 Cubes and circles can also be positioned for use as ottomans or side tables. Upholstery Material: Faux leather Assembly Required: No Overall: 18 H x 18 W x 18 D Shape: Square Overall Product Weight: 16.09lb. Upholstery Material: Microfiber/Microsuede Overall: 17.5 H x 14 H x 17 W x 14 W x 17 D x 14 D Shape: Square Overall Product Weight: 16.5lb. Love your homes look, but still looking for the perfect finishing piece? 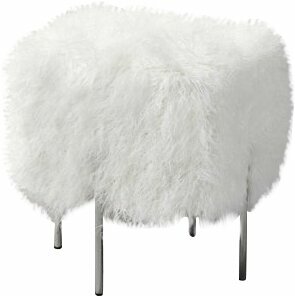 Add a touch of texture with this fuzzy ottoman to take your space from simple to stylish in seconds. 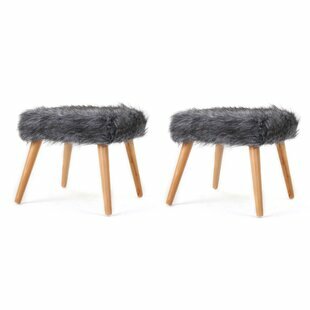 A must-have addition to glam ensembles, it showcases a seat that is wrapped in faux fur upholstery. The slim flared wood legs give this piece a midcentury foundation, and the neutral color palette can blend in with a variety of aesthetics. Try setting it in front of your favorite arm chair for a spot to sit back and rest... Upholstery Material: Faux Fur Assembly Required: Yes Overall: 16 H x 16.5 W x 16.5 D Shape: Square Overall Product Weight: 14lb. 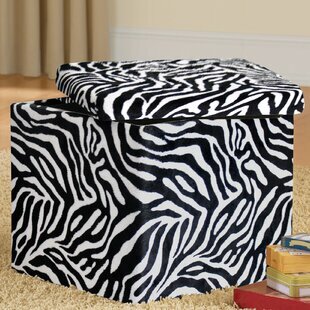 Add style and color to your living room or bedroom with this Small Pouf. 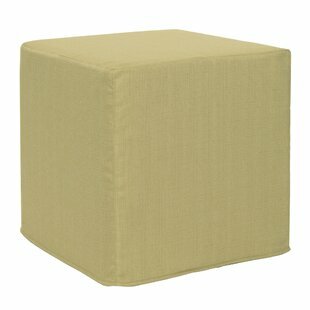 This cube is perfect for use as a footstool, side table or as extra seating for guests. 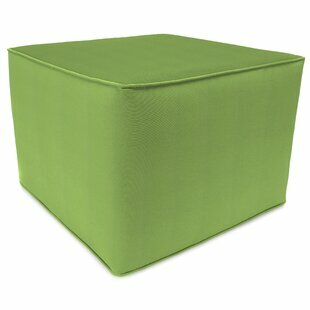 Woven from Cotton, these cube ottomans are durable yet comfortable. The beanbags are eco-friendly and feature a zippered slipcover. Hand wash slipcover with mild detergent and line dry. Upholstery Material: 100% Cotton Assembly Required: No Overall: 17 H x 17 W x 17 D Shape: Square Overall Product Weight: 5lb. 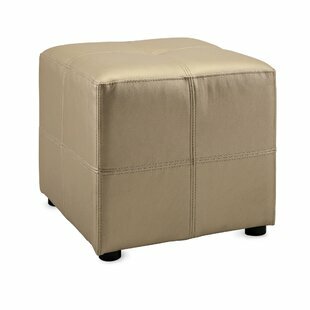 Refresh your space with Grubbs Ottoman. 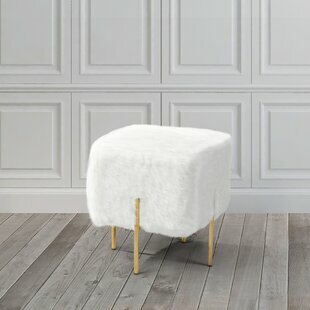 Boasting clean lines and a sleek modern look, this ottoman comes expertly topped with soft and luxurious white sheepskin. 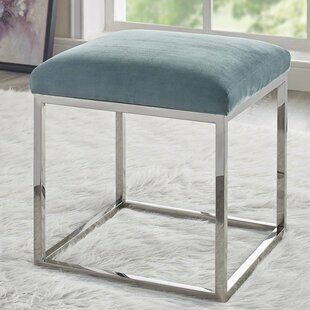 A conversation piece that makes a stunning decor statement, this ottoman is supported by a polished stainless steel base, and non-marking foot pads that help protect your flooring. Upholstery Material: Velvet; 100% Polyester Assembly Required: No Overall: 17.5 H x 17.5 W x 17.5 D Shape: Square Overall Product Weight: 13lb. 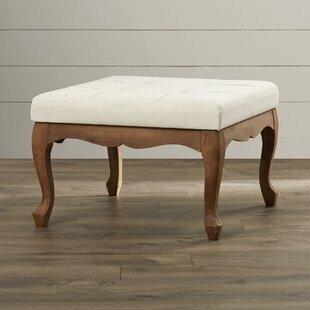 Perfect at the foot of a bed or chair, this ottoman will bring character to any room. 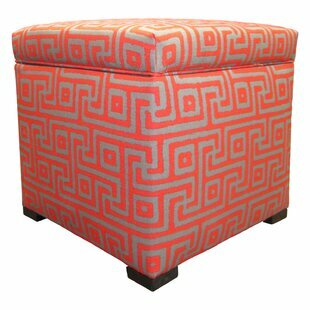 Upholstered in an eye-catching pattern, this ottoman is finished with a nail button trim along the base. Its a great addition to any accent chair or paired as a set at the end of a bed. Upholstery Material: 100% Cotton Assembly Required: No Overall: 16 H x 19 W x 19 D Shape: Square Overall Product Weight: 22lb. 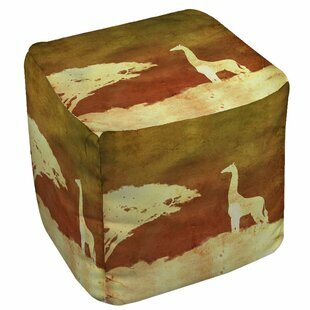 Beautiful art by Pam Ilosky creates an animal themed design in earth tones perfect for this printed pouf ottoman. 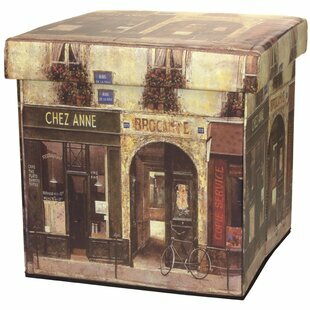 The zippered, removable printed cover, features the design in each panel, and is made from easy care polyester fabric. A separate fabric zippered insert contains the durable polystyrene beads that provide the fill. The ottoman is great for resting tired feet at the end of a long day or makes great extra seating when needed. 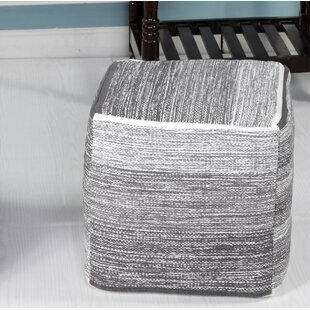 Cover can be removed; machine washed cold, gentle cycle... Upholstery Material: Polyester Blend Overall: 13 H x 13 W x 13 D Shape: Square Overall Product Weight: 5lb. 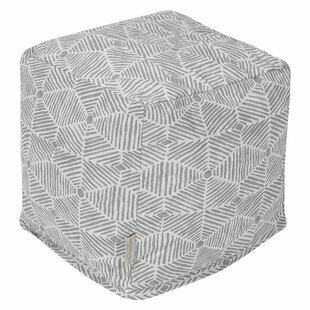 This Crim Le Mans Quilted Pouf can enliven the interiors of your home as it can be used as an additional seat to place around a coffee table, in front of a seat and sofa. 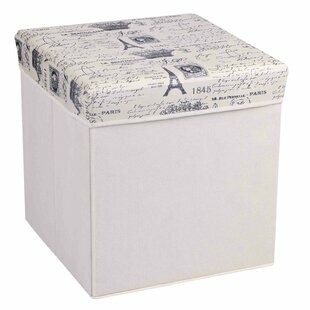 This pouf is a must-have interior accessory for any discerning home. Upholstery Material: 100% Cotton Upholstery Material Details: 100% Cotton Overall: 14 H x 20 W x 20 D Shape: Square Overall Product Weight: 3.5lb. 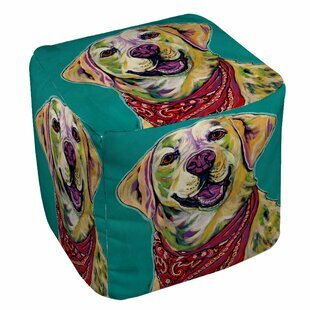 Beautiful art by Sally Evans creates a pet themed design in bright and colorful tones perfect for this printed pouf ottoman. The zippered, removable printed cover, features the design in each panel, and is made from easy care polyester fabric. A separate fabric zippered insert contains the durable polystyrene beads that provide the fill. The ottoman is great for resting tired feet at the end of a long day or makes great extra seating when needed. Cover can be removed; machine washed cold... Upholstery Material: Polyester Blend Overall: 13 H x 13 W x 13 D Shape: Square Overall Product Weight: 5lb. 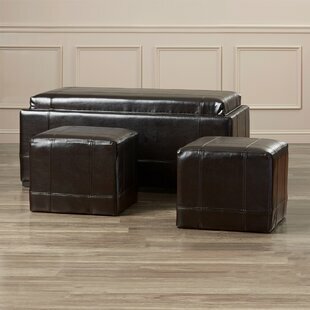 The Contreras Sterling Cube Ottoman is constructed with a dense light-weight foam and then topped off by a soft, high quality foam making it sturdy yet comfortable. Its unique design allows weight to be distributed evenly keeping it from tipping like most foam ottomans. Upholstery Material: 100% Polyester Assembly Required: No Overall: 17 H x 17 W x 17 D Shape: Square Overall Product Weight: 6lb. This Ottoman allows you to prop your feet up while tending to baby. It features a nicely padded top to rest your feet upon and is upholstered in a soft-to-the-touch microfiber fabric. 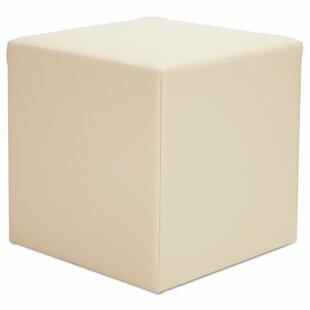 Available in a number of beautiful and soothing shades, the ottoman will blend in to your existing nursery decor easily. 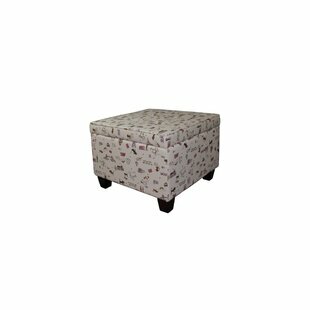 The cherry finished solid wood feet match the fabric beautifully. Upholstery Material: Microfiber/Microsuede Assembly Required: Yes Overall: 16.75 H x 22 W x 22 D Shape: Square Overall Product Weight: 10.12lb. 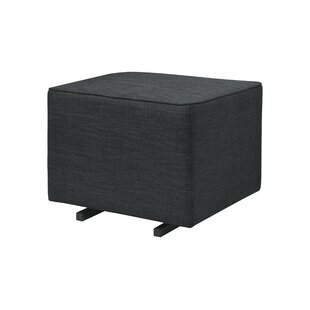 Complete any seating group or entertainment space in simple style with this understated ottoman, the perfect piece for your low-key and loft-worthy environment. 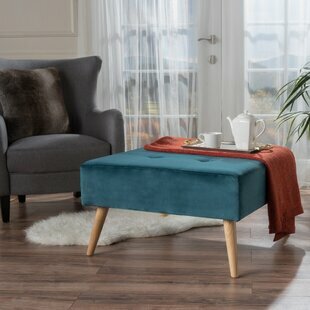 Featuring a solid pine frame with a cube silhouette, this ottoman is a simple addition to your subtle ensemble, while its velvet upholstery and rounded top bring a refined touch to the space. Set it in front of an upholstered arm chair in the living room to kick your feet up while you lounge after a long day at work, or keep a pair... Upholstery Material: Velvet Overall: 16 H x 17 W x 17 D Shape: Square Overall Product Weight: 12lb. 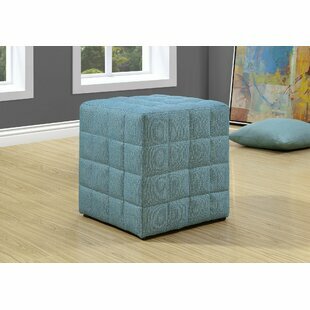 Enjoy class and top-notch style with this Tufted Cube Ottoman. The rich quilt design includes a durable light brown linen-look upholstery. The exquisite tufted cushioning provides perfect comfort and can conveniently be used as a footrest, extra seating, or as an accent piece for any room in your home. Assembly Required: No Overall: 17 H x 16.75 W x 16.75 D Shape: Square Overall Product Weight: 10lb. Jordan Manufacturing indoor/outdoor poufs make a great accessory item to any space where you want to add a splash of color and style. Filled with foam to help retain shape. Upholstery Material: Polyester Blend Assembly Required: No Overall: 15 H x 25 W x 25 D Shape: Square Overall Product Weight: 3.5lb. Kick up your heels and relax with the Kiwi Ottoman. This Kiwi Ottoman swivels a smooth 360-degrees and glides back and forth on a sleek, stainless steel base. 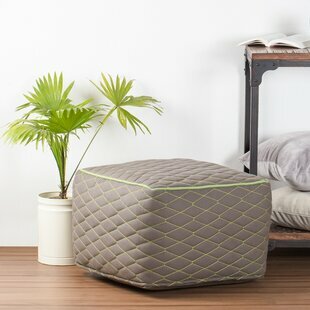 Stylish and functional, this Kiwi Ottoman will be a smart choice for feeding time with your babe. Upholstery Material: Polyester Blend Assembly Required: No Overall: 18.1 H x 20.1 W x 22.4 D Shape: Square Overall Product Weight: 39.6lb. Upholstery Material: Faux leather Overall: 42.1 H x 17.3 W x 18 D Shape: Square Overall Product Weight: 15lb. Upholstery Material: Polyester Blend Assembly Required: No Overall: 15 H x 15 W x 15 D Shape: Square Overall Product Weight: 5lb. 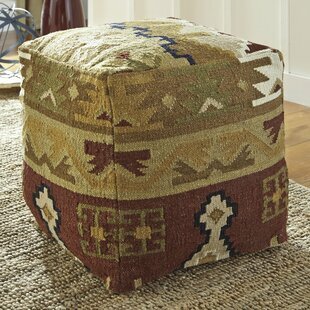 Inspired by global designs, this ottoman lends worldly flair to your ensemble. Crafted from wood, its frame sports a Moorish arch cutout dotted with nailhead trim to draw the eye, while bi-cast faux leather upholstery rounds out the look in fine form. Measuring 17.9 H x 21.3 W x 21.3 D, this versatile design can act as a footrest in the living room, a spare seat in a small-scale seating arrangement, or even an impromptu side table during bustling soirees. Upholstery Material: Faux leather Assembly Required: No Overall: 17.9 H x 21.3 W x 21.3 D Shape: Square Overall Product Weight: 13.6lb. Sure to be a to die for part of your space, this delightful pouf will effortlessly become the focal point of any home decor. 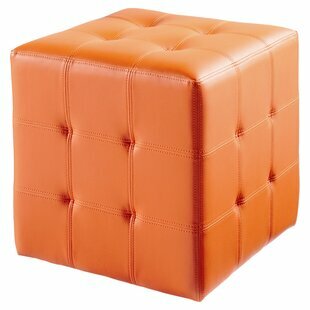 Featuring a brilliant cube-shaped pouf. Made of pure cotton this piece will emanate a sense of timeless charm in your home decor. A great pick for those who have a taste for the finer things. Upholstery Material: 100% Cotton Overall: 16 H x 16 W x 16 D Shape: Square Overall Product Weight: 3lb. Upholstery Material: Faux leather Overall: 16.25 H x 17 W x 17 D Shape: Square Overall Product Weight: 11lb. Upholstery Material: Other Upholstery Material Details: Bicast leather Overall: 20 H x 14 W x 14 D Shape: Square Overall Product Weight: 9.8lb. 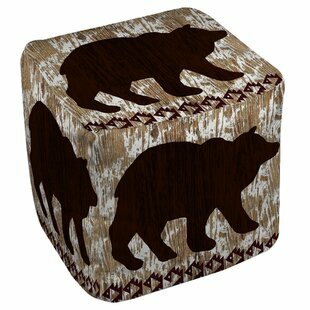 Beautiful art by Nicholas Biscardi creates a lodge themed design in chocolate perfect for this printed pouf ottoman. The zippered, removable printed cover, features the design in each panel, and is made from easy care polyester fabric. A separate fabric zippered insert contains the durable polystyrene beads that provide the fill. The ottoman is great for resting tired feet at the end of a long day or makes great extra seating when needed. Cover can be removed; machine washed cold, gentle cycle... Upholstery Material: Polyester Blend Overall: 13 H x 13 W x 13 D Shape: Square Overall Product Weight: 5lb. Beautiful art by Fisher / Warnica creates an urban themed design in multi-color perfect for this printed pouf. The zippered, removable printed cover, features the design in each panel, and is made from easy care polyester fabric. A separate fabric zippered insert contains the durable polystyrene beads that provide the fill. 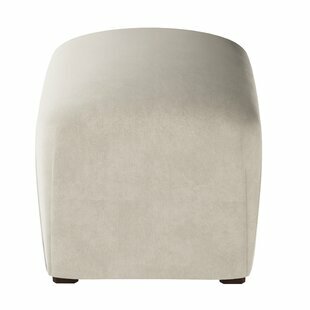 The Pouf is great for resting tired feet at the end of a long day or makes great extra seating when needed. Cover can be removed; machine washed cold, gentle cycle, air dry. Upholstery Material: Polyester Blend Overall: 13 H x 13 W x 13 D Shape: Square Overall Product Weight: 5lb.